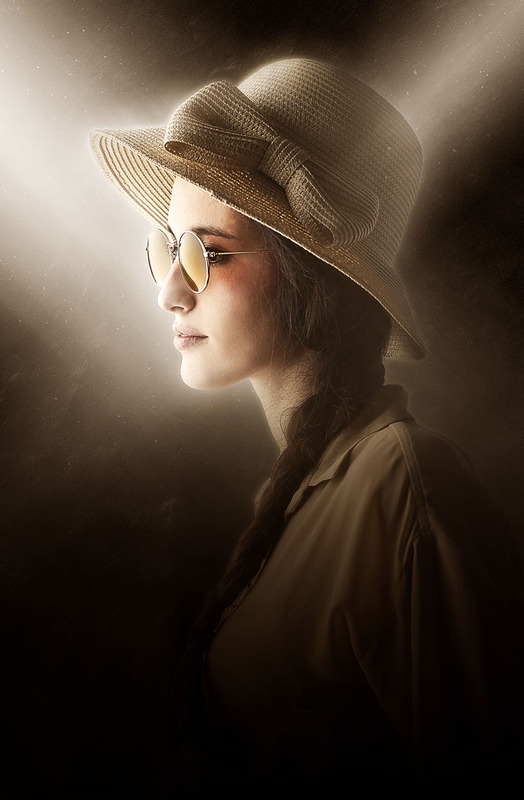 In this tutorial you will learn how to create an amazing dark fantasy effect from your own photos. I will try to explain everything in so much detail that everyone can create it, even those who have just opened Photoshop for the first time. 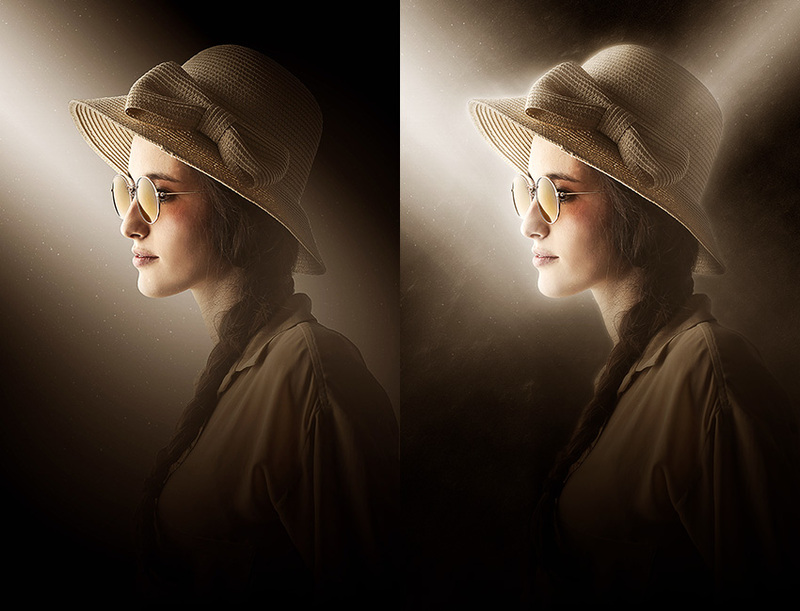 The effect shown on the left is the one I will show you how to create here in this tutorial. Your photo should be in RGB Color mode, 8 Bits/Channel. To check this go to Image > Mode. For best results, your photo size should be between 1500-4000px wide/high. To check this, go to Image > Image Size. There are a lot more ways for creating a selection, but in this example I am going to use the Magic Wand Tool (W). If you decide to use the same tool, just adjust the Tolerance and start creating the selection of your subject. Use the Shift-Alt buttons on your keyboard to add or subtract some areas from the selection. Feel free to change the tolerance often. 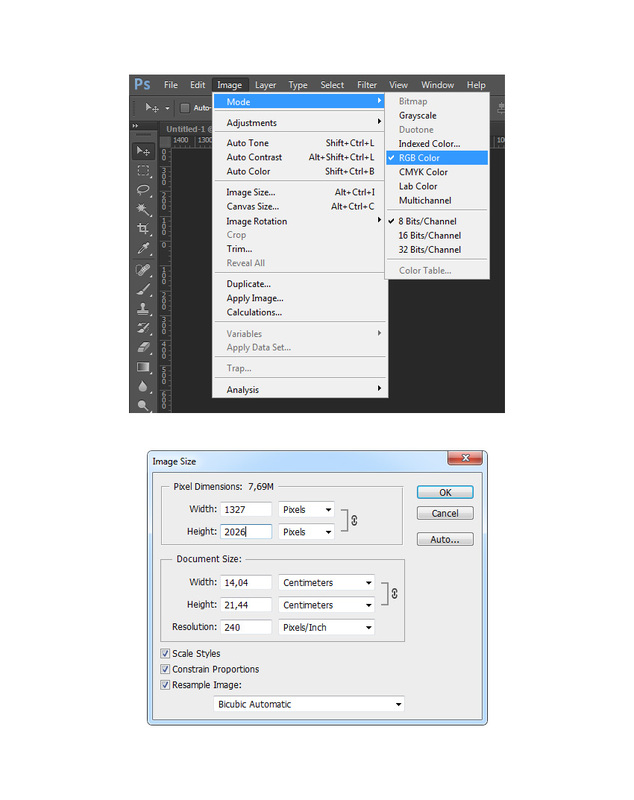 Sometimes it is easier to make a selection of the background (like in this example), so then create a selection of the background and go to Select > Inverse to invert the selection, and you will get a selection around the subject. Now go to Layer > New > Layer Via Copy to create a new layer from your photo, using the selection you have made. Now you have your subject on a separate layer. Double-click on the layer name and type Main Photo. 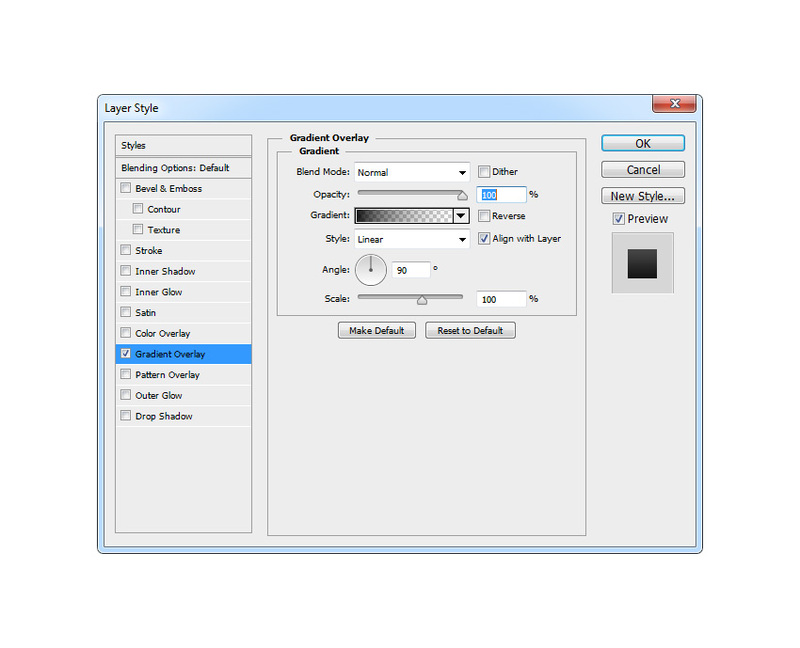 Select the Background layer and go to Layer > New Fill Layer > Solid Color to create a new solid color fill layer. 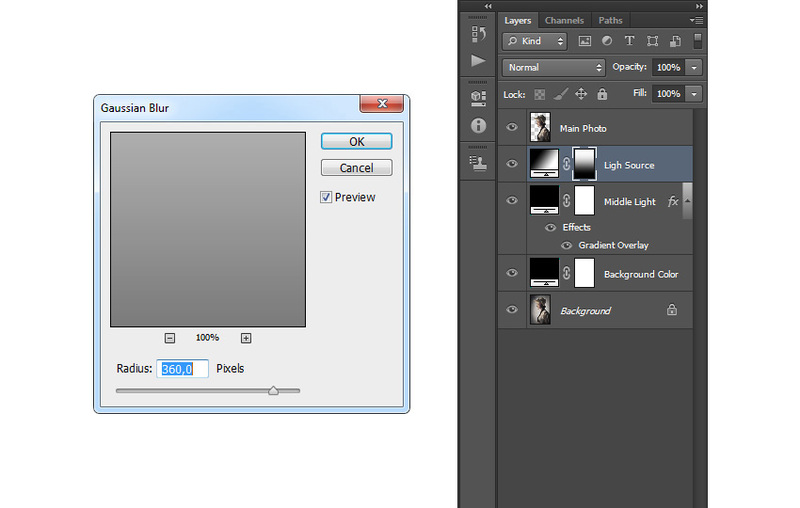 Name it Background Color and choose OK. After that, you will see another popup window asking you to choose the color. 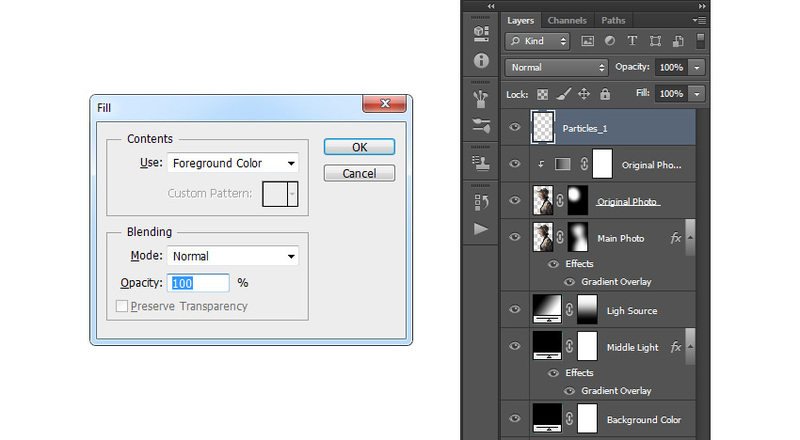 Choose black (#000000) and click OK.
Drop the Opacity of this layer to 25%. Now, to create the light source, go to Layer > New Fill Layer > Gradient to create a new gradient fill layer. 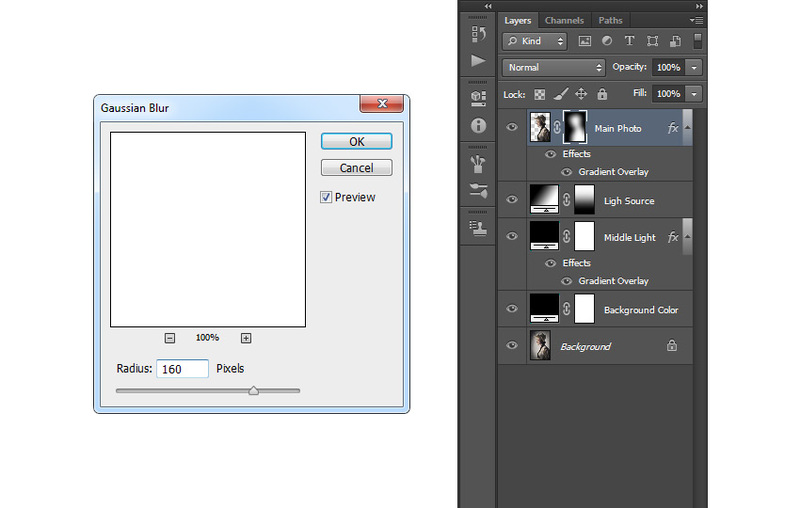 Name it Light Source and choose OK. After that, you will get another popup window with gradient fill settings. Choose the settings below and hit OK.
Now we need to make sure the lighting doesn’t go to the bottom of the photo. To do that, we are going to use a layer mask. Select the layer mask of the current layer, press D and then X on your keyboard to set the foreground color to black, and go to Edit > Fill. Apply the settings below and choose OK. 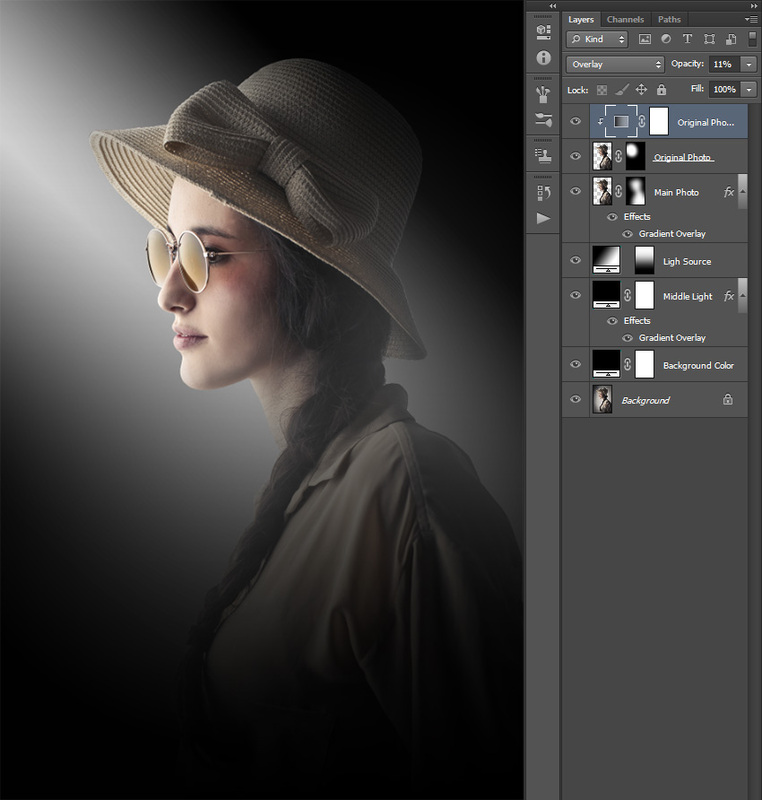 While this layer mask is selected, pick the Lasso Tool (L), right click anywhere inside the canvas, and choose Free Transform. Set the Reference Point Location and Vertical Scale as shown below, and hit Enter. 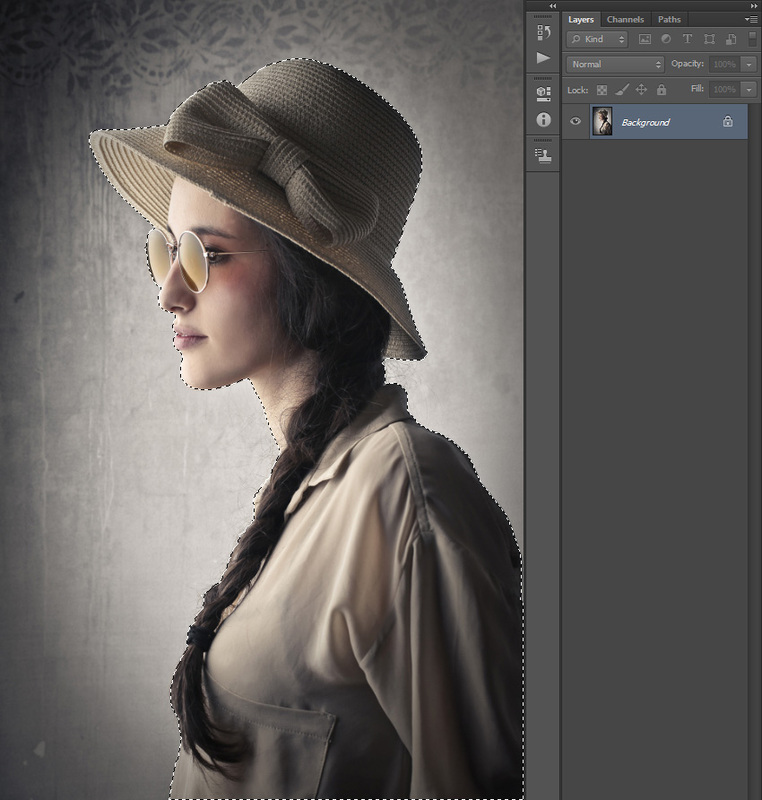 While this layer mask is selected, go to Filter > Blur > Gaussian Blur and set the radius as below. 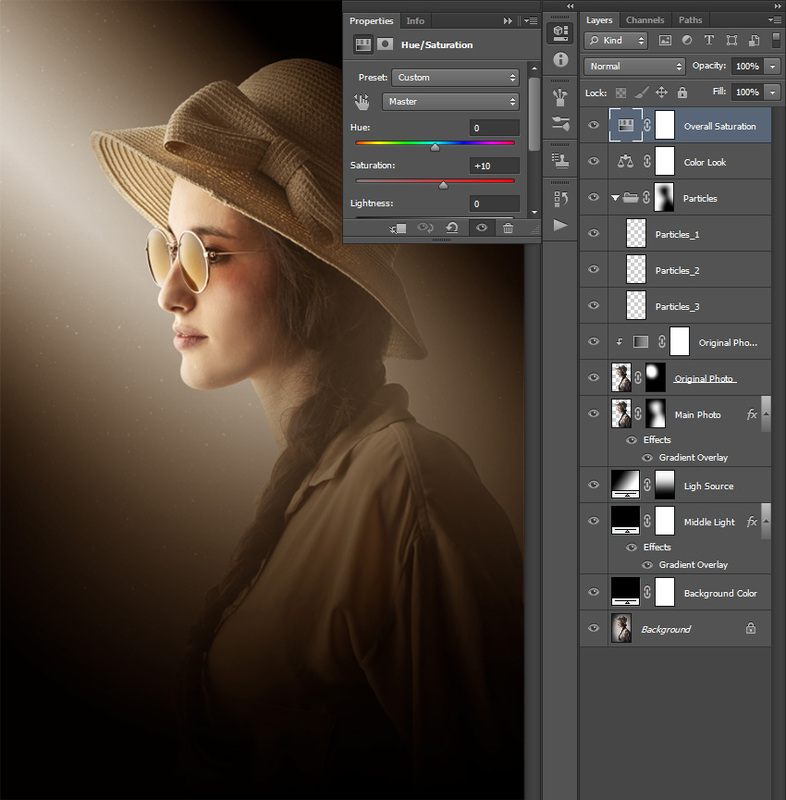 Change the blending mode of this layer to Screen and drop the Opacity to 85%. Control-Click on the current layer thumbnail to make a selection of that layer and go to Select > Modify > Contract. 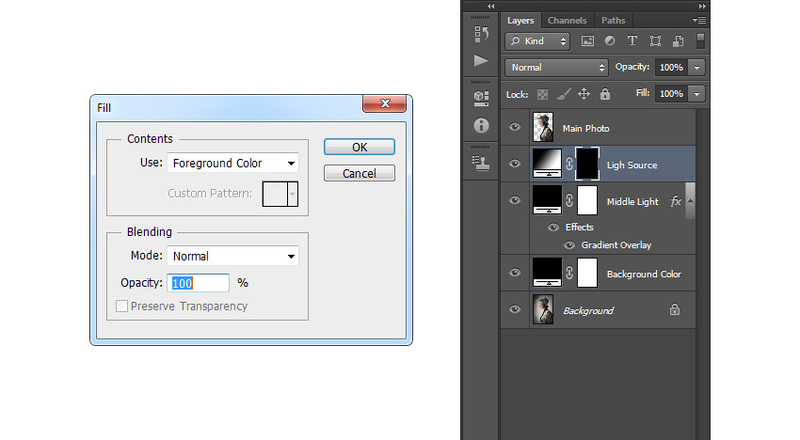 Set Contract By to 30px and choose OK.
Go to Layer > Layer Mask > Reveal Selection. 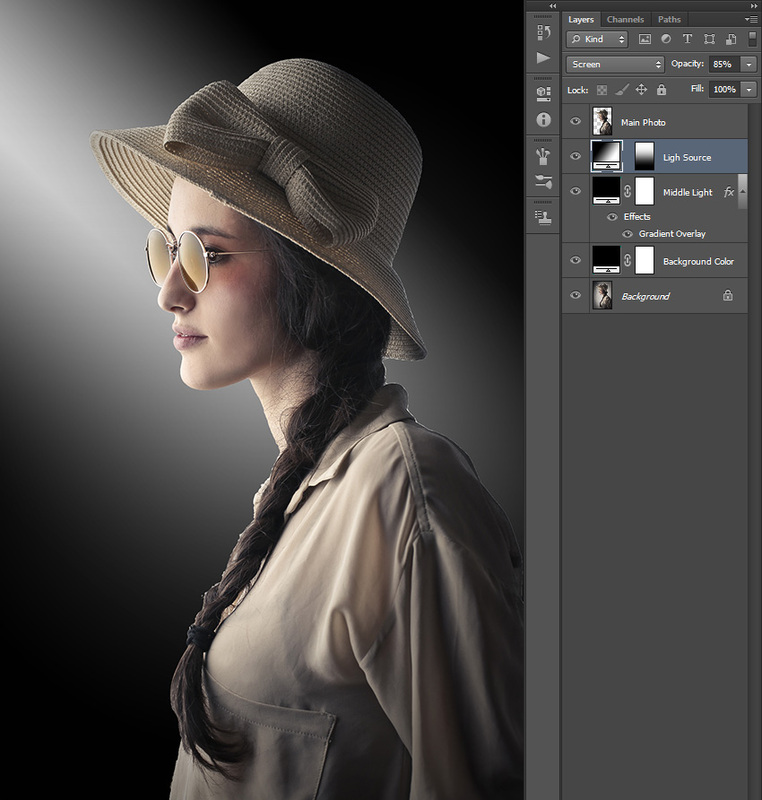 Now we need to highlight the key parts of our subject, considering the light source direction. 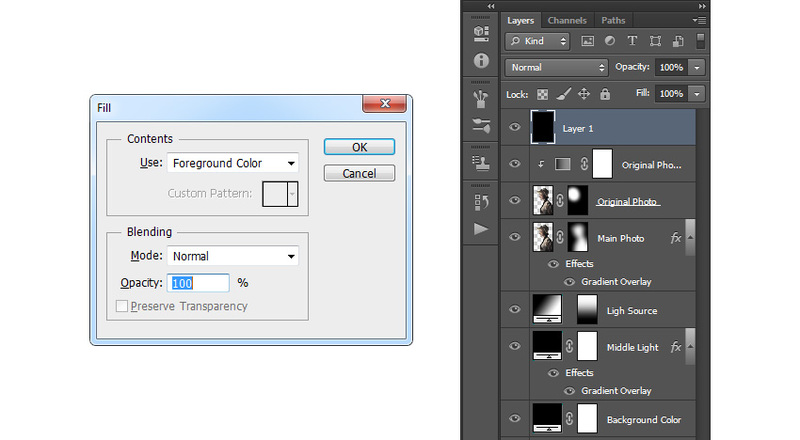 Select your Main Photo layer and go to Layer > New > Layer Via Copy. Then double-click on this new layer name to rename it, and type Original Photo. Now we have to remove the layer mask and clear the layer style of this layer. So go to Layer > Layer Mask > Delete to remove the layer mask, and go to Layer > Layer Style > Clear Layer Style to remove the layer style. Our whole subject will be highlighted now, and we don’t want that, so we need to create a new layer mask for this layer. Go to Layer > Layer Mask > Hide All and then take the Brush Tool (B), pick a soft brush, press D on your keyboard to set the foreground color to white, and just brush over key parts of your subject according to the light direction. Now let’s add a bit of contrast to our highlighted subject parts. To do that, select the Original Photo layer thumbnail, press D on your keyboard to reset the swatches, and go to Layer > New Adjustment Layer > Gradient Map to create a new gradient adjustment layer. Name it Original Photo Contrast and choose OK. 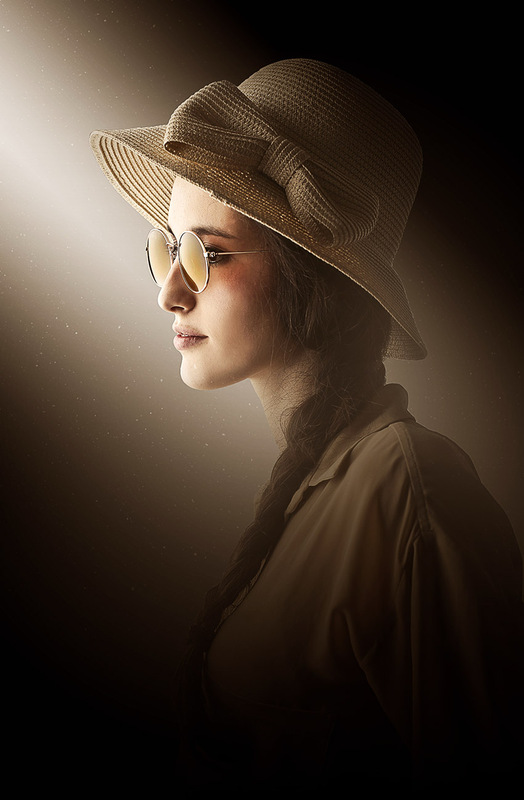 Contrast will be applied to the whole photo, but we want it to be applied only to highlighted subject parts, so go to Layer > Create Clipping Mask. 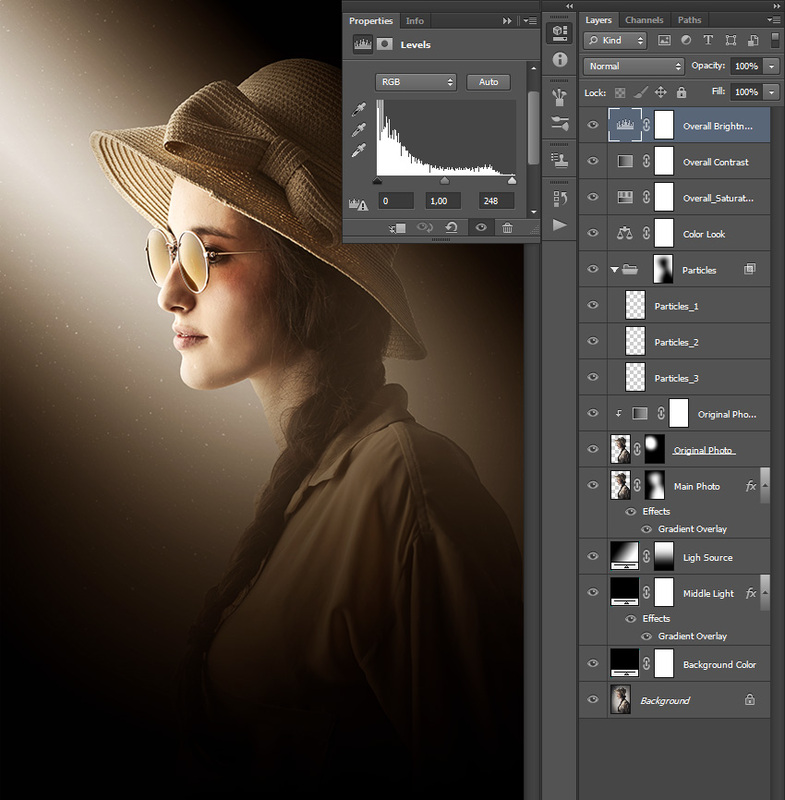 Change this layer blending mode to Overlay and drop the Opacity to 11%. Now we are going to add some small particles. Go to Layer > New > Layer to create a new layer. You can use the default layer name as this layer will be removed in the next few steps. Press D on your keyboard to set the foreground color to black and go to Edit > Fill > Foreground Color. 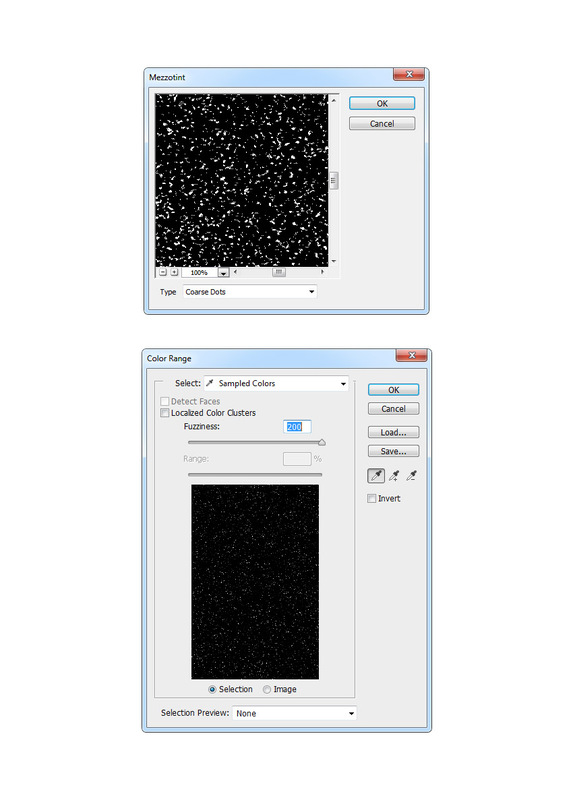 Now go to Filter > Pixelate > Mezzotint and set the type to Coarse Dots. Now go to Select > Color Range and, using the Eyedropper Tool, select the white color by clicking on some of the white particles in your photo, and set the Fuzziness to 200. 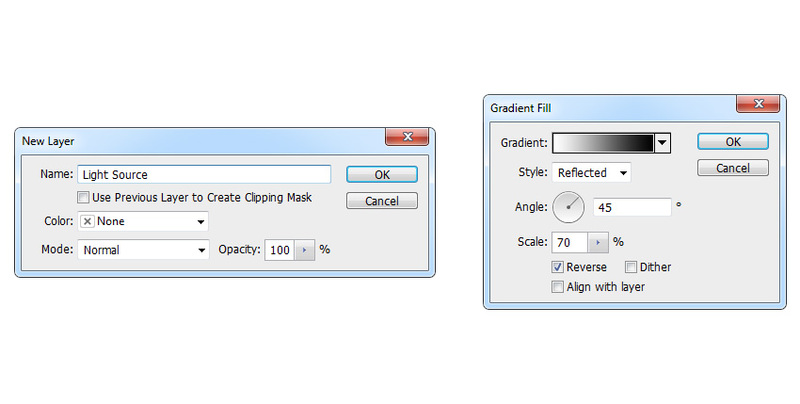 Now go to Select > Refine Edge and choose the settings below. Then go to Layer > New > Layer to create a new layer and name it Particles_1. Press D and X on your keyboard to set your foreground color to white, go to Edit > Fill, and apply the settings below. Go to Select > Deselect, select Layer 1, and go to Layer > Delete > Layer. Change the blending mode of this layer to Overlay and now, depending on how many particles you want, you can repeat this step to create more. I have repeated it twice more, so I got three particle layers. Now select the top particle layer (in my case Particles_1), hold Shift on your keyboard and select the last particle layer (in my case Particles_3). Then go to Layer > New > Group from Layers. Name the group Particles. Create a selection of your subject by holding Control-Click on the thumbnail of the layer Main Photo. Press D on your keyboard to set the foreground color to black and go to Layer > Layer Mask > Reveal Selection. 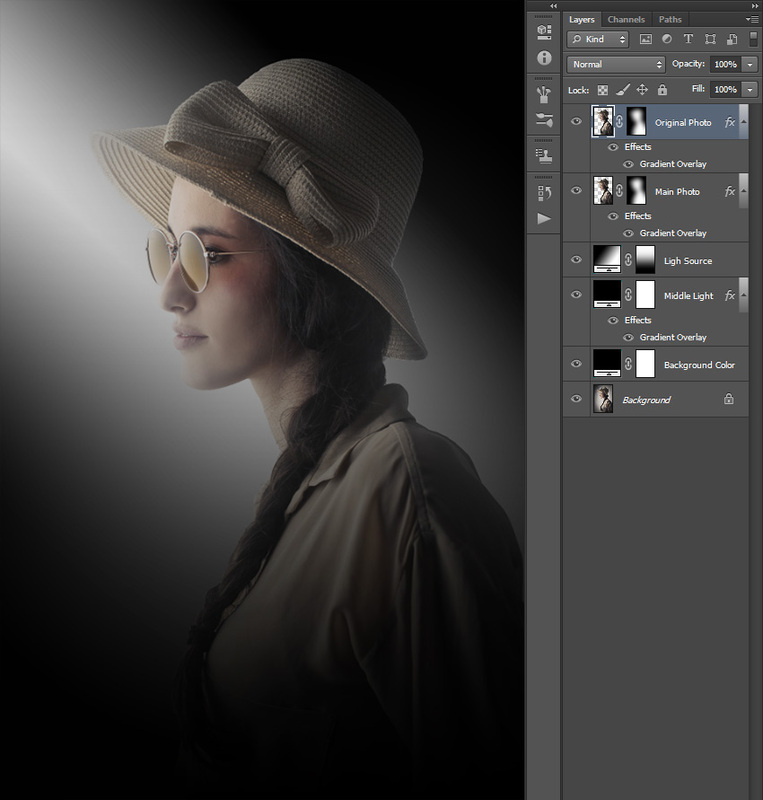 While this layer mask is selected, go to Image > Adjustments > Invert to invert the layer mask. Now, while this layer mask is still selected, go to Window > Properties. 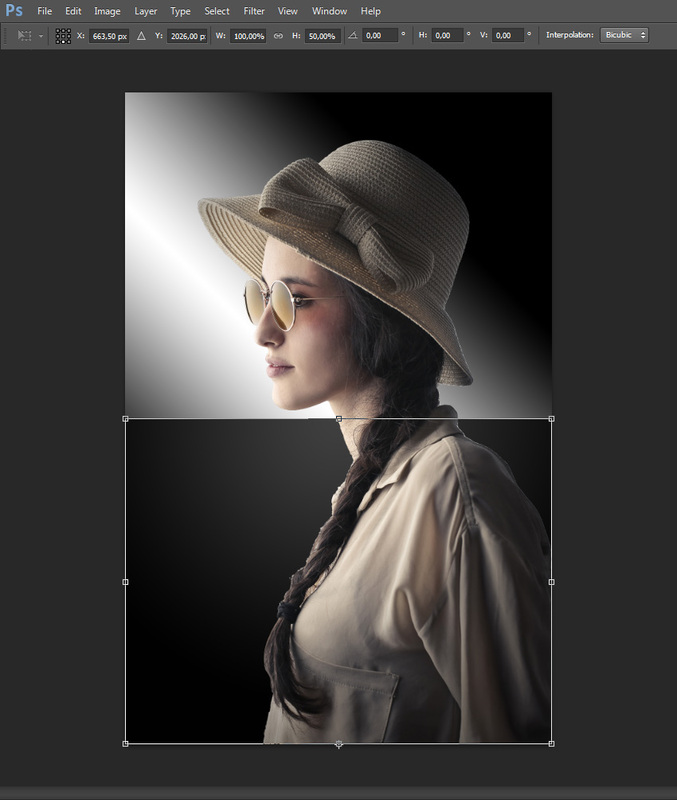 Inside the Properties panel, set the Feather to 160 px, and drop the Opacity to 54%. Now we are going to create a nice color look. 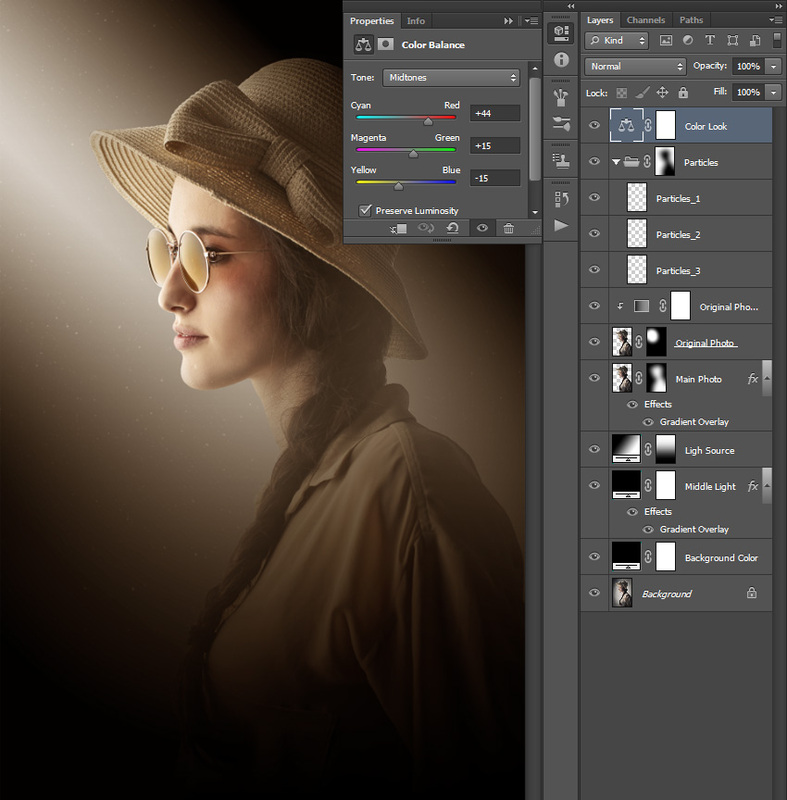 Go to Layer > New Adjustments Layer > Color Balance to create a color balance adjustment layer and name it Color Look. 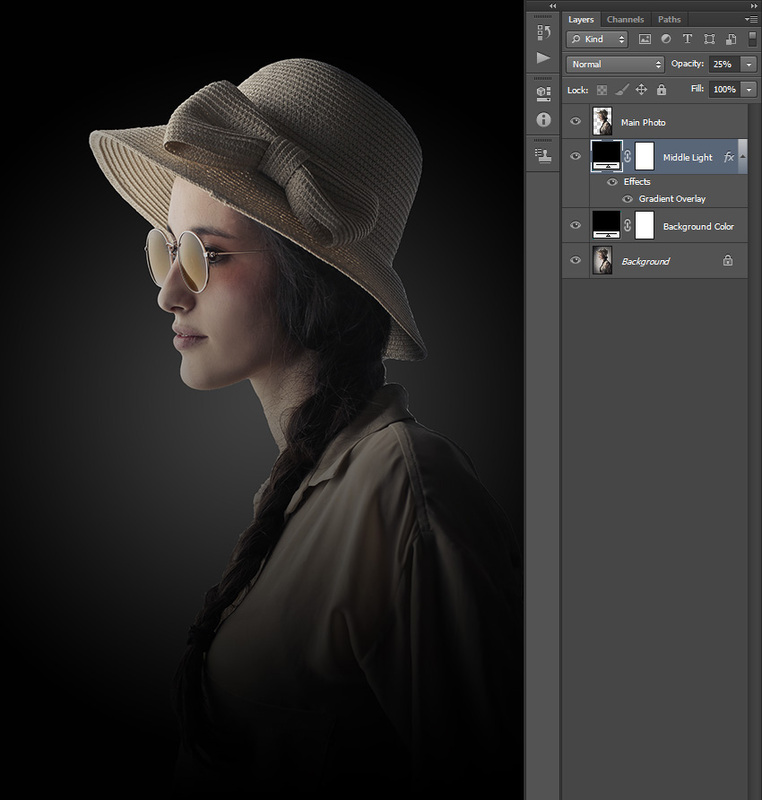 Now we are going to make some final adjustments to our photo, using several adjustment layers. First we are going to add saturation. Go to Layer > New Adjustment Layer > Hue/Saturation to create a new hue/saturation adjustment layer and name it Overall Saturation. Now we are going to add some contrast. 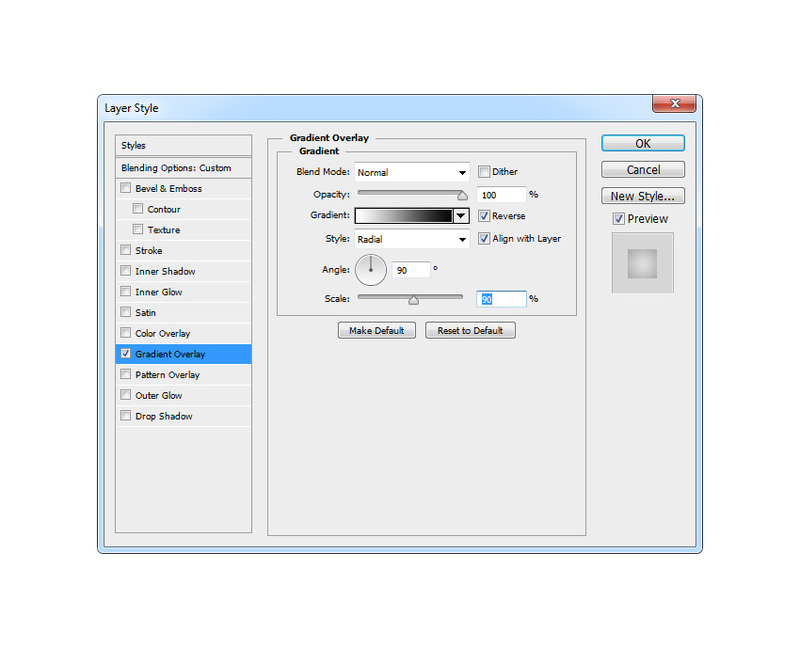 Reset the swatches by pressing D on your keyboard, and go to Layer > New Adjustment Layer > Gradient Map to create a new gradient adjustment layer. Name it Overall Contrast. 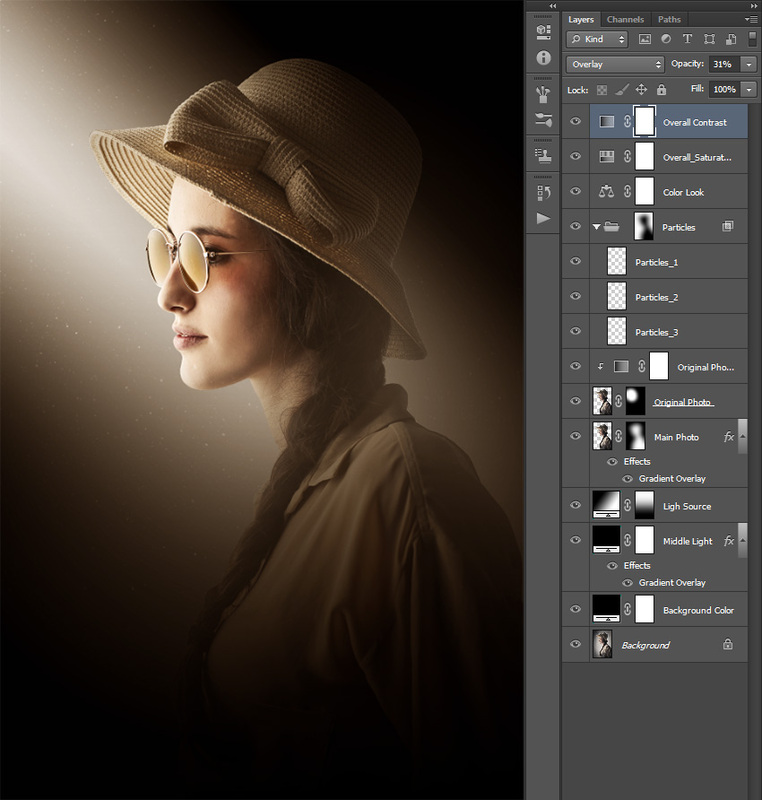 Change the blending mode of this layer to Overlay and drop the Opacity to 31%. Now we are going to adjust the brightness. 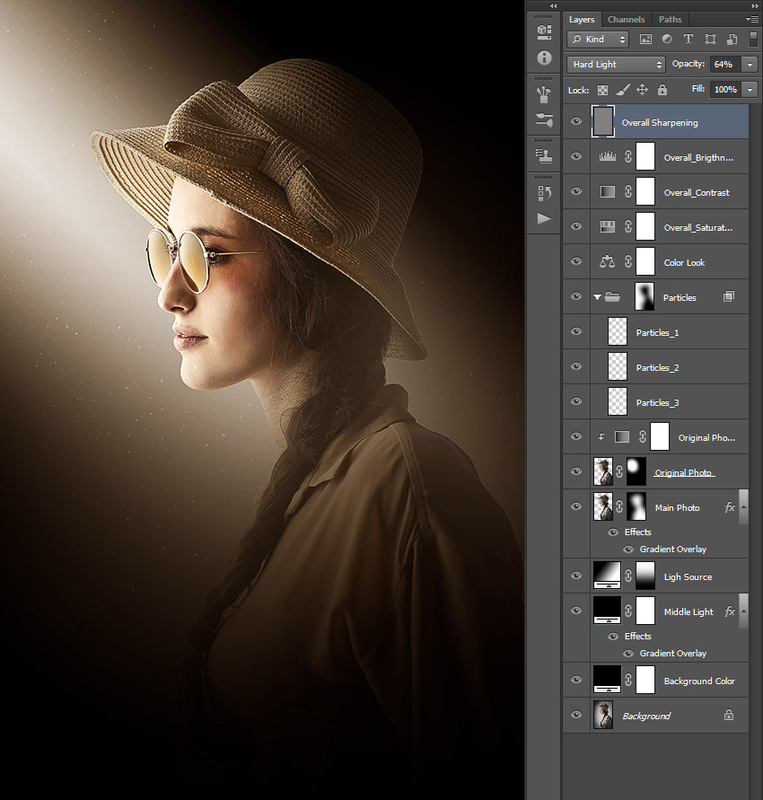 So go to Layer > New Adjustment Layer > Levels to create a new levels adjustment layer and name it Overall Brightness. Finally, let’s add some sharpening to our photo. Press Control-Alt-Shift-E on your keyboard to make a snapshot. 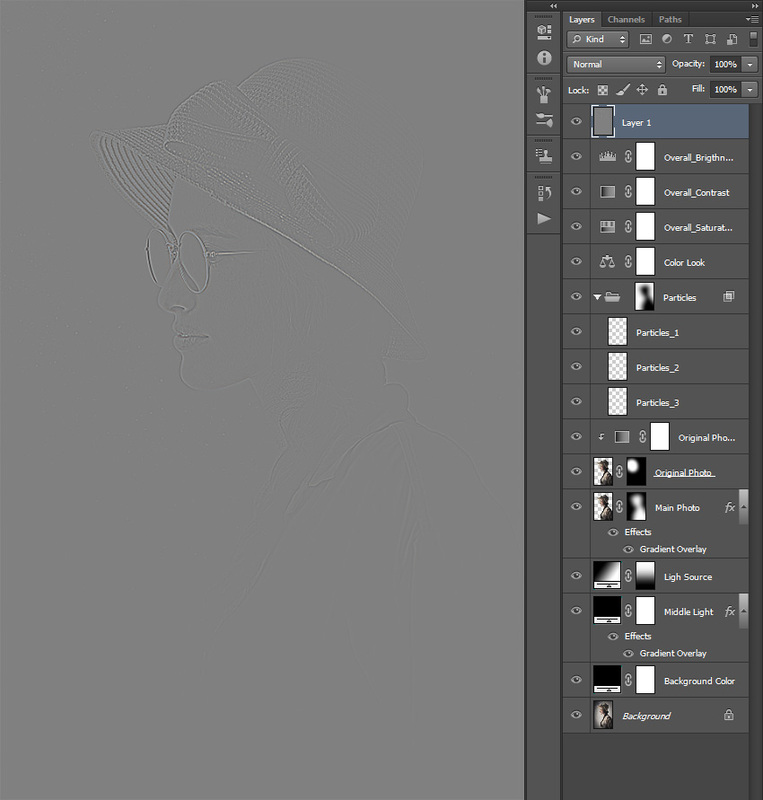 Go to Filter > Other > High Pass and set the radius to 2 px. 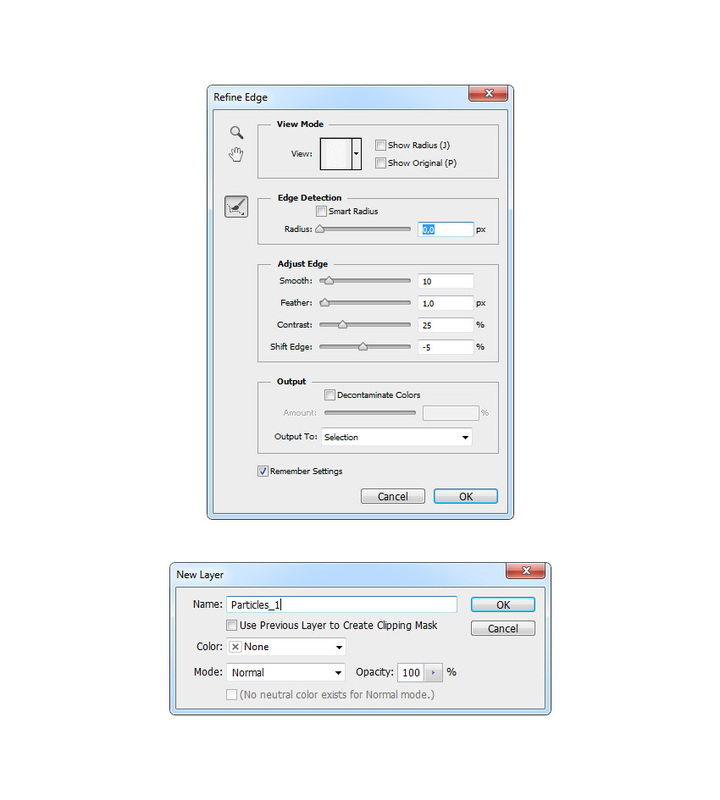 Double click on this layer name to rename it and type Overall Sharpening. 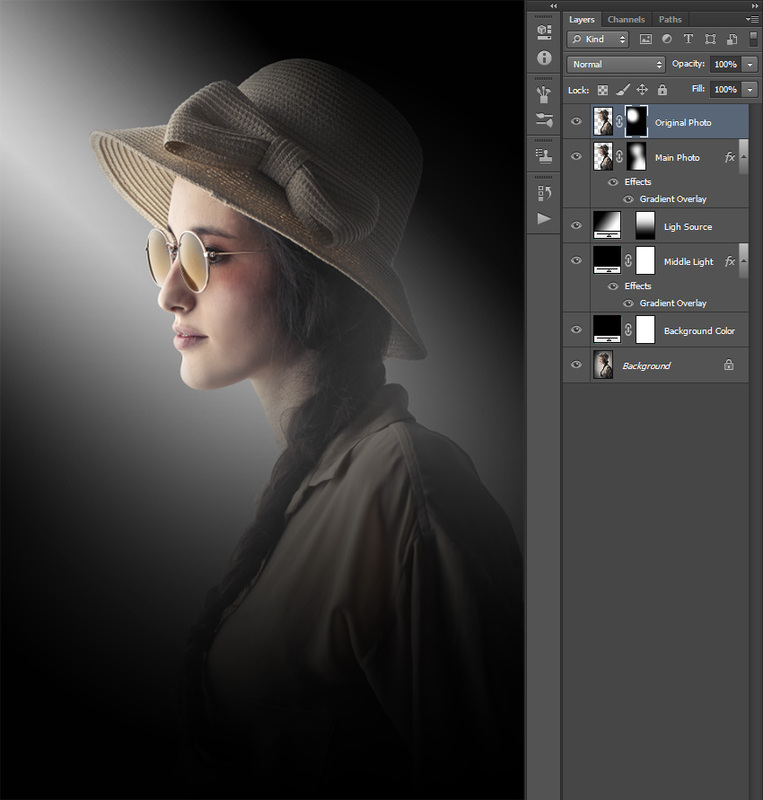 Change the blending mode to Hard Light and drop the Opacity to about 64%. You can now customize the final effect; I will give you a few tips. Select the Light Source layer, double-click on its thumbnail, and change the Angle and/or Scale. 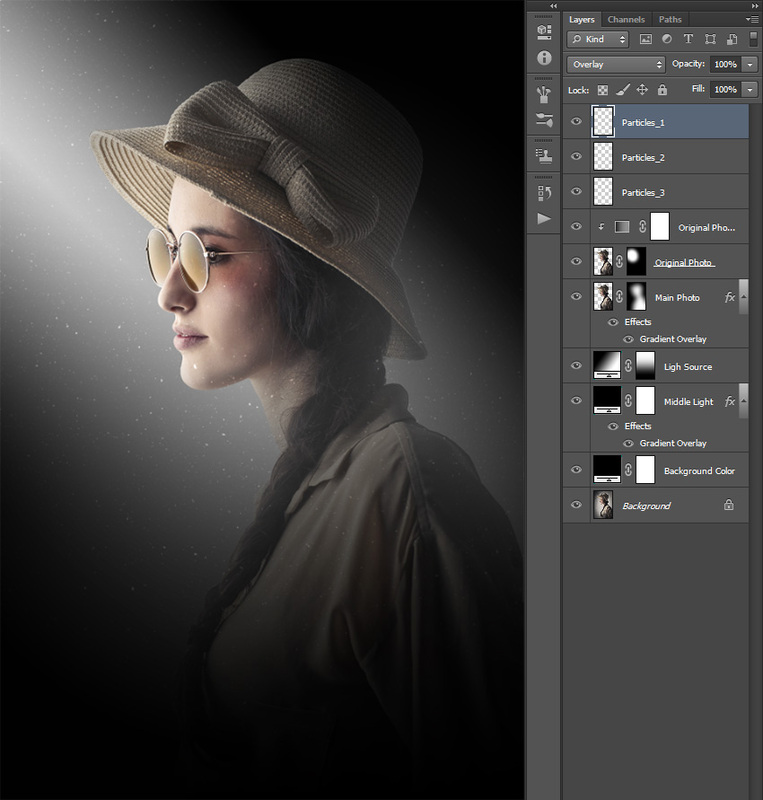 Select the layer mask of the layer Original Photo, pick the Brush Tool (B), pick a soft brush, and brush white/black into the mask to make a different area to be highlighted. 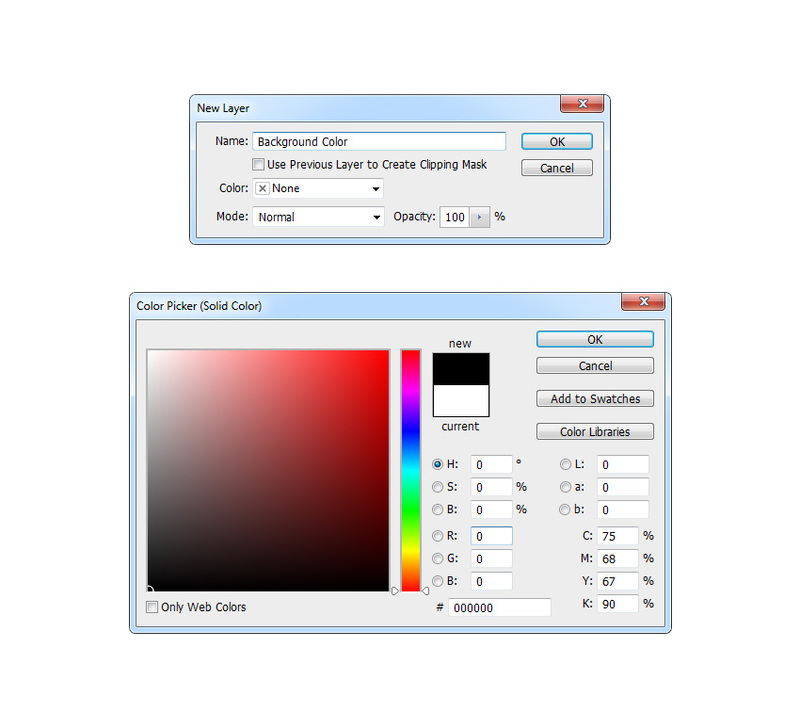 Select the Background Color layer, double-click on its thumbnail, and change the color. Select the Color Look layer, double-click on its thumbnail, and inside the Properties panel change the settings for a different color look. 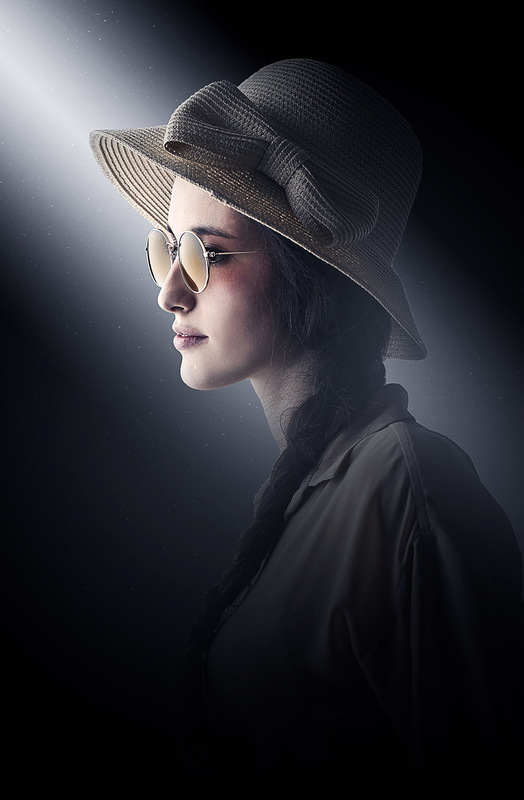 If you would like to create an even more advanced dark fantasy effect as shown below, using a single click in just a few minutes, then check out my Dark Fantasy Photoshop Action. The action works so that you just brush over your subject, play the action, and the action will do everything for you, giving you fully layered and customizable results. 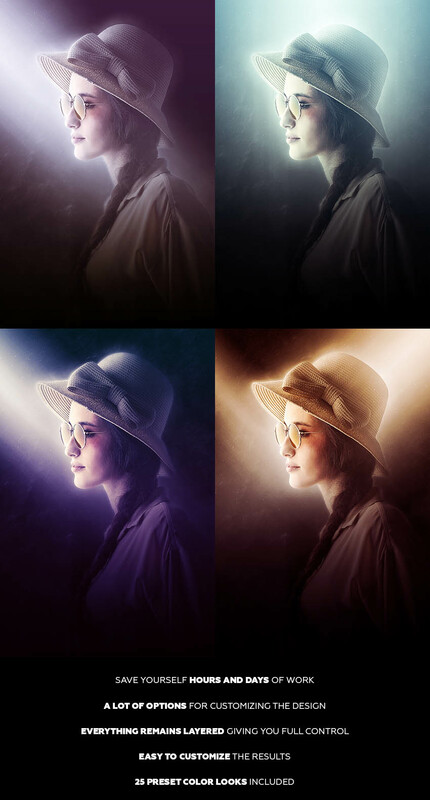 The action will also create 25 preset color looks for you. It comes with a detailed video tutorial that demonstrates how to use and customize the look of your action to get the most out of the effect. CoffeeShop “Memories” Fine Art Texture/Overlay Pack!